We are here to help you extend the life of your pet, so you can create extra years of memories with your fur babies! 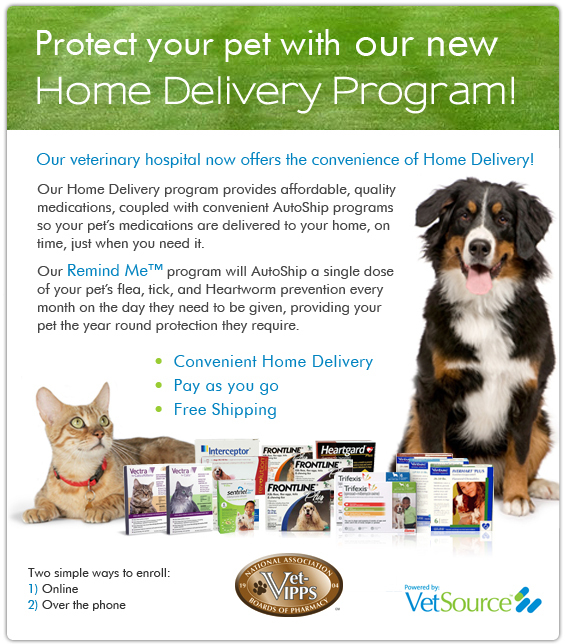 We are pleased to now offer home delivery to our clients! Prescriptions, preventatives and prescription diet food is now available at the click of a button! Click the icon below to get started or ask one of our friendly receptionist for more information! We now have a pet portal available through vetstreet.com for every pet that comes to see us. Use the icon below to login or register your pet to view when you're due or to make changes to your account information. Ready for a personalized experience with a vet that cares? We take the time to listen to your concerns, and schedule appointments that are twice as long as most vet clinics. If you live in Richmond, TX or the surrounding area then you have picked the perfect site to find a veterinarian. Dietz Family Pet Hospital is a full service veterinary clinic offering state-of-the-art equipment in a homespun charming environment to enhance your veterinary visit with us. Dietz Family Pet Hospital is a licensed veterinarian, treating all types of pets and animals. Your pet's health and well being is very important to us and we will take every step to give your pet the best possible care. We care for the dogs, cats and other pocket pets of Fort Bend County servicing Richmond, Rosenberg, Greatwood, Sugar Land, New Territory, Fulshear, Beasly and Needville. Services provided include traditional and holistic medicine, general and orthopedic surgery, internal medicine, geriatric care, critical care, pain management, allergy treatment, comprehensive in-house laboratory, digital radiography, laser therapy, acupuncture, and emergency after hours care. Our goal is to make your visit the most courteous and caring veterinary experience of your pet's life. From the moment you bring home your new puppy or kitten we want to be part of your family! We have a number of resources for you to learn about how to take better care of your pets. Browse around and look at our articles and pet videos. The best veterinary care for animals is ongoing nutrition and problem prevention. If you want to ask a question call %CLIENT_PHONE% or email us and we'll promptly get back to you. Our %CLIENT_CITY% veterinarian office is very easy to get to, and you can find directions on our Contact Us page. You can also subscribe to our newsletter which is created especially for %CLIENT_CITY% pet owners. In between your vet visits, your pet will benefit from you reading these free informative articles. At Dietz Family Pet Hospital, we have warm hearts for wet noses! "I am grateful for his patience to explain all the issues with my animals. I don't know what I would do without Dr. Dietz and his staff!!"